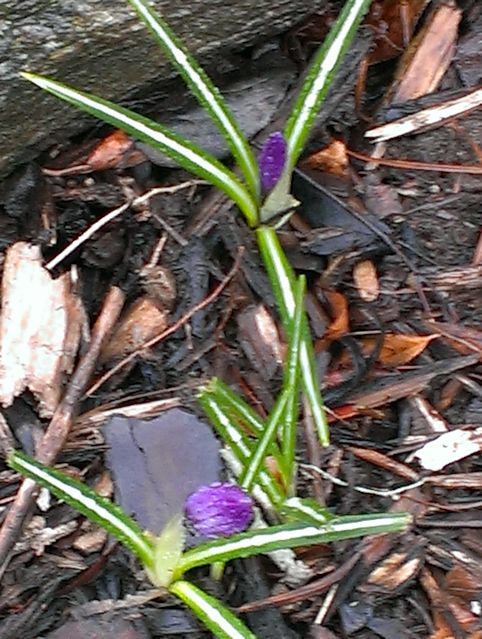 I had been wondering if I would see any crocuses in my garden this year, after such a long, cold winter. The spot where they are planted faces north and doesn’t get as much winter sunlight as some other parts of my yard. Usually they bloom in early March, but there was nothing at all emerging from the hard-frozen ground when I looked a month ago. They did start coming up eventually, though, and are just starting to bloom. This week I’ve been reflecting on patience and the natural growth process vs. to-do lists and schedules. It’s all too common for people in today’s busy world to feel rushed and overloaded, not because of having daily tasks that actually require huge amounts of time and effort, but simply because there is always something more on the to-do list. Rather than finishing our work for the day and enjoying a peaceful evening, we think ahead to the errands planned for tomorrow, the business meetings next week, and so forth. Now that it’s April, I am one-quarter of the way through my 2014 resolution to discover and comment on a positive blog every day. Several people have complimented me for this resolution, while also telling me that they wouldn’t have the time for it. In all honesty, not being perfect, I have occasionally missed a day and then made up for it by visiting two blogs the next day. Staying on schedule is not what’s important here; what matters is the incremental growth throughout the year, however it may be accomplished. As for how to find enough time for projects in general, I believe that a childlike perspective of “play time!” can make a world of difference. In our culture, we get used to filling our days with scheduled tasks to be completed. Then we veg in front of the TV or find other mindless entertainment to give our brains some downtime, but that doesn’t completely distract us from the piles of stuff waiting to be done tomorrow, and every day after that. Life starts to feel exhausting. New projects become stressful commitments of time we’re afraid we might not have, rather than just being fun ideas for something we’d like to do. I have to confess I almost fell into that trap when the idea of visiting a new blog every day first occurred to me. The task-scheduling part of my brain promptly kicked in with criticism—had I totally lost my sanity, putting 365 new items on the to-do list for the year? How was I ever going to manage that? And because it would take different amounts of time depending on how quickly I found a positive blog on any given day, I couldn’t even block out a nice neat defined chunk of time for planning purposes. Then I realized I should be looking at it as a daily adventure—a journey or quest, instead of a series of scheduled tasks requiring detailed advance planning. Back when we were kids and went outside to play after school, we didn’t have calendars telling us to play tag from 4:30 to 5:30 on Mondays and to pretend we were astronauts from 4 to 6 on Tuesdays. We just walked down the street and asked our friends what they wanted to play; and if we changed our minds about it, well, that was okay too. That’s not to say we should all throw away our schedules and lists. Life really does get complicated in the modern world, and often it’s useful to plan our daily tasks. But we don’t need to take it so seriously that we let those to-do lists control every moment of our lives. They should be helpful assistants, not tyrannical masters. Not everything needs to be done on a schedule. To-do lists can be much improved with a bit of imagination. Pretend you’re a little kid again and put stickers on the pages—smileys, rainbows, and cheerful affirmations. Write in some reminders to watch the sunset, imagine castles in the clouds, and just breathe. Oh what an important realization … “Staying on schedule is not what’s important here; what matters is the incremental growth throughout the year, however it may be accomplished.” Although some schedules are essential in daily life (ie jobs) … the mindful personal schedules are our journey not our destination — we are exactly where we are suppose to be when we are there … moving forward in increments for most of us is the most positive nurturing journey … we should not be competing with anyone else on our journey. Thank you for linking. You’re welcome, and thanks for your Thursday post also, Becca! Pingback: Nurturing Thurs – Surround Yourself | "On Dragonfly Wings with Buttercup Tea"
Meg, have you read Diane Ackerman’s book “Deep Play?” I think you would like it – she talks about the necessity and importance of play, even for us adults. And we do engage in play through our creative pursuits, sports, travel, etc, but don’t always recognize it as play. It fits in with your musings on setting aside our to-do lists every once in a while and enjoy doing or being whatever offers itself in the moment. Pingback: Nurturing Thurs – In a Moment | "On Dragonfly Wings with Buttercup Tea"